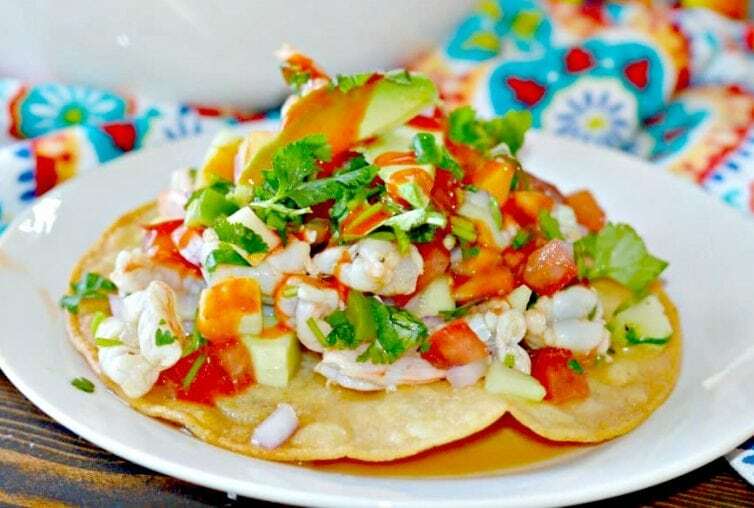 Inside: Learn how to make this popular, Mexican-Style Shrimp Ceviche with shrimp, lime juice, avocado, jalapeño, cilantro and finish it off with some hot sauce if that is your style. 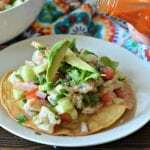 Shrimp ceviche is one of my favorite recipes from my hometown of Veracruz, Mexico. Veracruz is a port city located on the coast of the Gulf of Mexico. As a result, there is plenty of fresh seafood for anyone who likes it. For me, there is just about nothing better than a making a delicious shrimp ceviche with fresh ingredients during the summer. I always remember getting together on Sunday afternoons with my extended family and sharing fresh ceviche with freshly made tostadas. My siblings and I always went out to get the fresh shrimp and avocados from the market and those were some of my favorite memories. I love entertaining family and friends with this recipe now too! 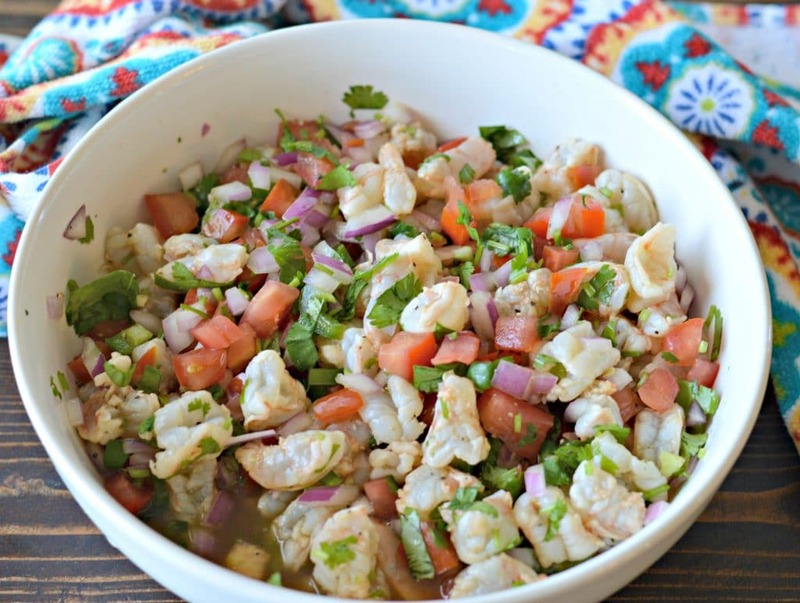 How Do You Prepare The Shrimp When Making Ceviche? One unique thing about making ceviche is that you don’t actually cook the shrimp (or fish if you are making fish ceviche) in the traditional sense. Instead, you soak the shrimp in lemon juice for about an hour until they turn pink and are ready to eat. This is the traditional way of preparing the shrimp for most ceviche recipes, and the result is a fresh, delicious flavor that is irresistible. 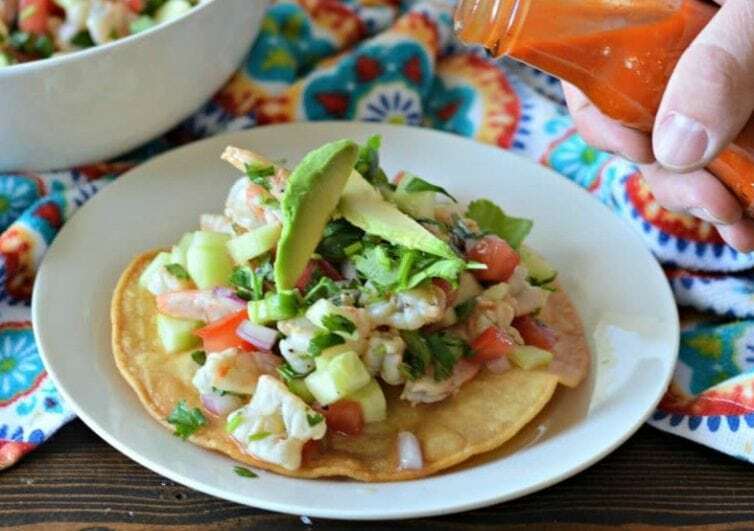 For a traditional Mexican ceviche made with shrimp, you have to use a good hot sauce. There are many different options to choose from, so you should definitely try out a few different types. Now that summer is arriving here in Colorado, I am going to be sure to make this ceviche recipe as much as possible. I love to make a nice fresh batch and serve it with tostadas so that everyone can come and grab as much or as little as they want. It is really a perfect option for family gatherings and more. 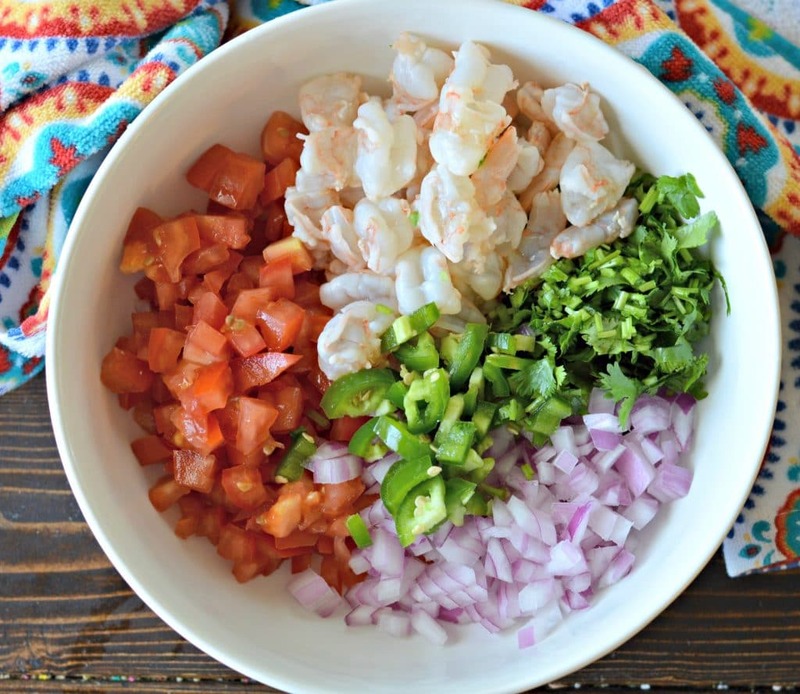 One bite and I know that you will agree that this is the best shrimp ceviche recipe around! Set of Bowls. You will want a nice set of mixing/serving bowls to combine all of the ingredients and serve this shrimp ceviche. This is a great option that I got for Christmas and I recommend it! Knife Set. You will be chopping up a lot of vegetables and the shrimp for this recipe, so you will want a good set of knives like this one. Cutting Boards. You will also need a good cutting board to use those new knives on. This set comes with three different sizes and they are quite durable. Shrimp Ceviche made with shrimp, lime juice, avocado, jalapeño, cilantro and finished off with Frank's RedHot for some delicious heat. Combine all of the shrimp with 1 cup of lime juice in a large bowl. Cover and let rest in the refrigerator for at least one hour until the shrimp are mostly pink. In a separate bowl, combine the onion, cucumber, tomatoes, jalapeño, and cilantro. Add the Worcestershire sauce, and season with salt and pepper and additional lime and lemon juice. Mix well and serve on the tostadas adding Frank's RedHot to taste and avocados. Thanks, Maggie! Glad you enjoyed it. I am new to making this and didn’t know that I should’ve cut the shrimp up before I soaked in lime juice. They were not “cooked” through after an hour. So I took them all out and cut them, put them back in, but all of the other veggies are mixed in with them. I added more lime juice to help, but do you think it’s still ok to eat as long as the shrimp pieces look opaque? If it has been sitting for a few hours or even better over night it is fine. I did the same kind of thing the 1st time i made ceviche lol i did cut the shrimp just not small enough . I had to take them out like you did and make the shrimp peices smaller and in a few hours it was fine to eat . I boil them till they turn a little pink, then put in ice bath, then soak in the lemon. I am making a double batch of this for a potluck at work. Should I be fine letting the shrimp soak in the lime juice for about 9 hours? Or should I let the shrimp cook, then add it and let the whole mixture in the fridge overnight? Hi Tara – as long as the shrimp soaks in the lime juice for at least 1 hour, you should be fine. Just make sure that after you add it to the rest of the ingredients, you keep it refrigerated until you are ready to serve. I hope it turns out great! Let me know if you have any other questions. Bit of a dumb question, but do we dispose of the lime juice used to ‘cook’ the shrimp or do we add the entire marinade plus the addtl lime and lemon juices? Hi Brian, not a dumb question at all! I never dispose of the lime juice used in the first step. You could, technically, but it isn’t necessary. If you do, you might just want to add a bit more lime and lemon juice in the final step. Good luck! Can’t wait to try this recipe this weekend. How many days will it keep in the refrigerator? Hi Rayetta – I recommend eating it as soon as possible, but you could probably keep it in the refrigerator about 3-4 days maximum. Otherwise, it will probably start to get a bit mushy. Good luck! I printed the recipe. Then, reading over the list of ingredients, I wonder – is 1/2 cup of Worcestershire sauce a misprint? Ceviche isn’t new to me, I’ve been making fish ceviche for many years….but Worcestershire sauce? Can I use frozen pre-cooked shrimp? Hi Evette, that should be fine, but I would thaw them out first. You will also not need to let it marinate for as long because the shrimp is already cooked. Good luck!